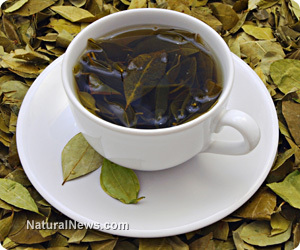 (NaturalNews) If you have weak teeth and bones, or simply would like to fortify yourself against future problems, select herbal teas are a great daily choice. Packed with bone enhancing compounds, these age-old elixirs are a tasty way to strengthen skeletal structure and shore up the teeth. An Ayurvedic herb has even been found to remove tooth and bone ravaging fluoride from water, providing an economical solution to this worrisome chemical. An easy way to strengthen the teeth and bones, nutrient dense herbal teas are often overlooked. When used in tandem with a healthy diet, bone issues can be corrected or avoided altogether. Many herbalists advise consuming the herbs as strong infusions to extract maximum mineral content. To prepare, measure 1 oz dried herb into a one quart mason jar. Fill with boiling water, cover and infuse at least 4 hours. Strain and enjoy several cups per day. Horsetail - Abundant in silicon and magnesium, this is a top notch herb for reinforcing connective tissue, teeth and bones. Used as a tea twice per day, horsetail helps reverse periodontal bone loss while encouraging rapid mending of fractures and breaks. It also facilitates calcium absorption. Only use spring gathered horsetail as mature varieties can irritate the kidneys. Nettle - Rich in calcium, magnesium, sulphur and protein along with vitamins C, D and K, nettle is a strong choice for bone health. One cup of infused nettle contains between 300-500 mg of calcium. Oatstraw - An exceptional source of calcium as well as saponins, flavonoids, alkaloids, steroids, lysine and methionine, oatstraw helps to stimulate bone cell growth according to the University of Maryland Medical Center. This is good news for those who would like to avoid brittle bones or are suffering from osteoporosis. "An experiment was conducted in the Yellareddyguda village of Narketpally Mandal. The researchers soaked 75mg of Tulsi leaves in 100ml of water that contained 7.4 parts per million of fluoride in the water. After only soaking the Tulsi leaves for eight hours, it was discovered that the level of fluoride in the water was reduced from 7.4 parts per million, to only 1.1 parts per million."